This post originally appeared on GeekDad.com. Reprinted with permission. 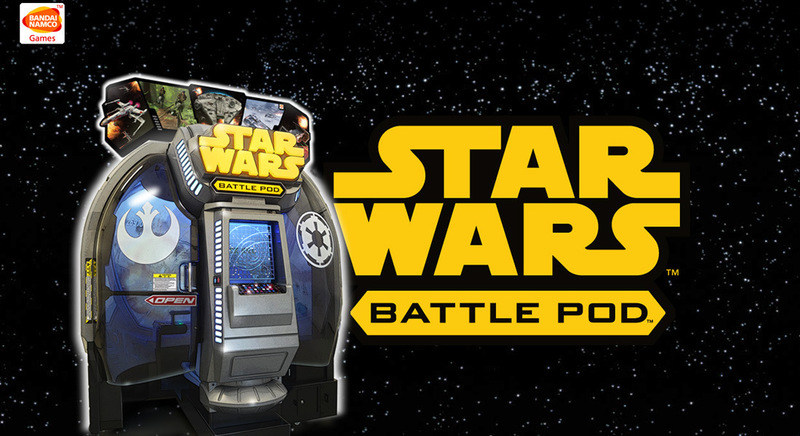 It’s been a little while since it was officially released, but with most local arcades having gone the way of the dodo I was thrilled to finally see the new Star Wars: Battle Pod on the floor of my local Dave & Busters. An arcade buff, I was giddy with excitement when the game, released by Bandai Namco, was announced several months ago. However, when I initially checked for the game during its launch, I couldn’t find one anywhere. I eventually gave up the search locally and figured I’d just wait to come across one during a future work trip, but here it was before me, shining like a beacon of geeky light. From the outside it is clearly identifiable as Star Wars by its giant logo and easily-recognizable rebel and imperial symbols. As with the trend in arcade games lately, this thing is big! However, after finding my way to the pod bay door, I squeezed into the seat and found out it wasn’t quite built for a 6’1” man with long legs. Knees be damned, I took stock of the controls: one flight stick with a trigger and a topside button for specials on the right and a throttle lever on the left. I swiped my payment card in lieu of a handful of quarters and was hopefully optimistic for what I was about to experience. The first Star Wars video game I ever played was not much more than a bunch of colored lines loosely assembled into shapes suggesting TIE Fighters and X-Wings. Back then, we were still playing outside with sticks, so the graphics of that early arcade game from Atari were mesmerizing. 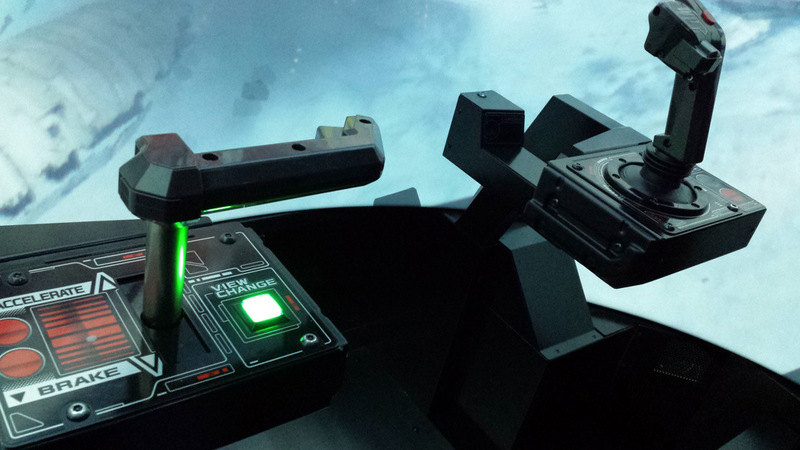 However, Battle Pod’s graphics and sounds are so advanced they stomp the games of my youth with the force of an AT-AT. The screen in front of you isn’t a normal LCD display, but rather a spherical shaped screen filled with an image from the projector mounted above your head. Better than IMAX, the screen fully envelopes your vision, including your periphery and it takes just a few moments before you can acclimate yourself to this new vision of a galaxy far, far away. The John Williams score surrounds you as you select between several familiar original trilogy scenarios: the Battle of Yavin (aka the 1st Death Star run), Hoth, Endor, the 2nd Death Star Run, and the “experts-only” Vader’s Revenge! After your selection, you ship hovers in the hangar bay until you fire your ship’s thrusters which then activates blasts of air to give your senses an extra boost of adrenaline before heading off into battle. Like I said, it takes just a short time to rid yourself of any motion-induced vertigo, but the game hurls you full-speed into action! I’m an admitted Star Wars fan, but I was cautiously optimistic when I first entered the capsule, not wanting to get my hopes up too much only to be let down. But once I felt that first blast of air and shot down my first TIE Fighter, I was hooked. I played the first three battle scenarios and found myself giggling with joy as I played the game. While the game treads on familiar territory (essentially the same scenes as SEGA’s Star Wars Trilogy arcade game from 1998), the immersive gameplay experience is so superior, it doesn’t feel like anything I’ve ever played before. In fact, the only downside I see to this game is the cost. While the video elements will transfer over well, the arcade experience is so unique that it can’t be replicated on a home system. However, with a purchase price of $29,000, family entertainment centers are forced to charge a premium to recoup their expense. And at that price, I doubt many consumers will be buying one for their basement game room anytime soon. Additionally, each credit is only good for one mission, so no matter how well you perform, when that mission ends so does your turn. Despite the premium cost, this game is worth every penny. I’ve played many new arcade games, but this is the first one in a long time that made me feel like a kid again.